Today I want to share with you an extremely easy but powerful way of obtaining lots of information for any specific niche. 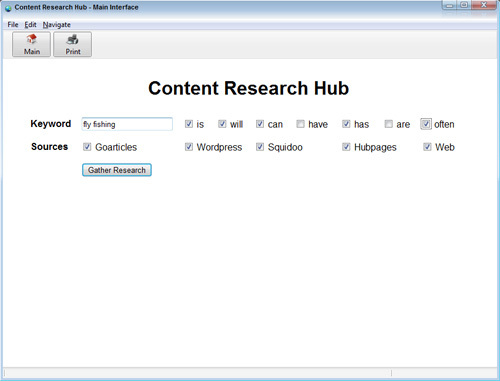 For this I am going to use one of my brand new software applications called ‘Content Research Hub’. This is the first version release for the software but I do plan on releasing a new version shortly that will have an ‘auto’ rewrite feature built into it. Ok, for this example I am going to use the niche ‘fly fishing’. 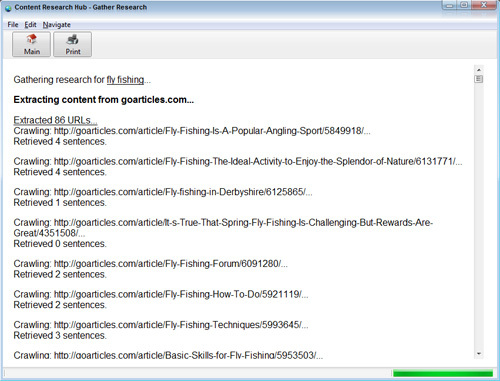 STEP 1: Open up the software and enter your keyword, in this case it is ‘fly fishing’. You would then tick the relevant boxes to tell the software what kind of phrases / sentences it needs to extract, for example.. ‘Fly fishing is….’, ‘Fly fishing can….’ etc. Then you select the sources you would like the software to extract from. For this example I have selected ALL of the sources. Lastly, you click the ‘Gather Research’ button. The software will then perform a number of searches and extract ALL relevant sentences from the hundreds of URLs it crawls. STEP 2: Once the software has finished crawling all the URLs, you can open up the information in a notepad document, or SAVE the information in .txt format. 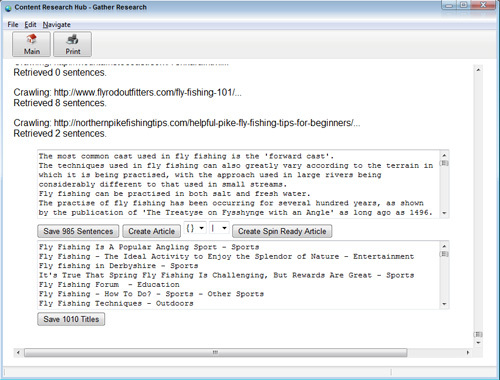 In this example the software extracted 985 relevant sentences / factual snippets of information. You can then choose to remove any low quality sentences and use this information to write your own articles. The software also extracts ALL the page titles as it crawls EACH URL which can be used to discover ‘ideas’ for new articles, or sub-topics for your niche. There are also two other features available to you from this point. After weeding out any unwanted sentences you can create an article using the available snippets of info by clicking on the ‘Create Article’ button. You can then edit or rewrite it to make it your own. You can also click the ‘Create Spin Ready Article’ button to take ALL of the available sentences and create a super size spin ready article that you can use in article distribution software or networks. I am looking to add an auto spin feature that will spin common elements and part phrases with a single click. This feature would need to be experimented with but can serve a very useful purpose and would allow users to create huge spun documents or articles with very little effort. As mentioned before, for a short time I am offering a 7 day trial for this product and all my other products for just $1. You can start your trial right now here….. Please feel free to leave a comment and offer your thoughts. I am interested in the content research hub. Is that software available for purchase without the monthly subscription? Hi Rick. At present it is only available via my subscription service. I guess it all depends on how my subscription service goes.